Whether you need to de-stress from the pressures of everyday life or just want to treat yourself to a little pampering, there’s nothing like checking into a fab hotel spa for some rest, relaxation and rejuvenation. From an urban oasis in Downtown LA to an oceanside retreat you won’t soon forget, here are eight hotel spas in Southern California that are well worth the cost of admission. Overnight stay not required. 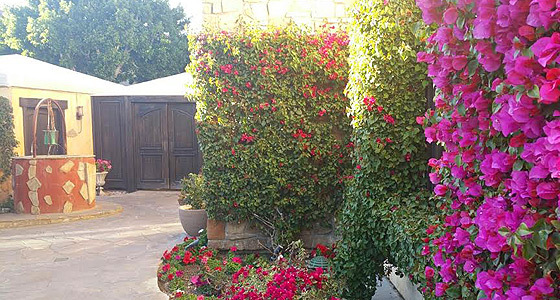 Truly one of the most charming properties you’ll ever visit in the Palm Springs area, Miramonte Resort & Spa in Indian Wells spans 11 acres yet everything is so accessible it feels incredibly intimate. The Well Spa (yes, there’s a little well where you can make a wish) carries on the Mediterranean-inspired vibe with lovely indoor and outdoor areas, two salt water pools (yes, please! ), eucalyptus steam room and plenty of treatment options like the Candela warm candle oil massage. (A real deal at $135 for 60 minutes considering you’ll have use of the facilities for the day.) During my visit, my husband and I tried something new — the Pittura Festa treatment. It starts with your own private outdoor area where you can paint each other’s bodies with a palette of colorful clays. It’s the coolest thing ever. Literally. The clay is really cool to the touch, so make sure you book it on a warm day! After about 20 minutes, you wash it off in the outdoor shower and then head inside to your adjacent private room for a customized 60-minute couples massage. At $395 for 90 minutes it’s a splurge, but the memories you’ll make are priceless. Looking to get away but don’t have the funds to jet over to Maui? No worries. 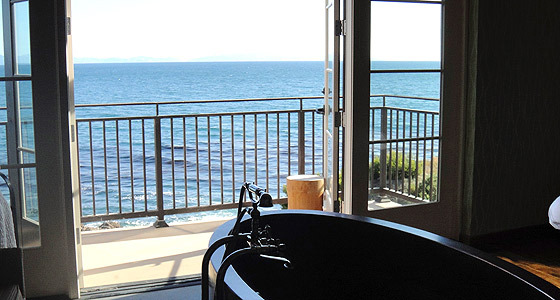 The Spa at Terranea will make you feel as though you’ve just arrived at some seaside paradise. The place is huge. Like 50,000 square feet huge. But it’s not the kind of huge that’s sterile and makes you feel like you’re going to get lost. It’s airy and serene. And there’s even a little juice shop, salon and shop in the main lobby area. There are 25 treatment rooms, a pool, outdoor hot tubs and three private VIP suites named after the elements: Earth (redwood sauna and shower), Fire (cozy fireplace) and Water (copper tub and the most incredible views of the Pacific). I got a massage in the Water suite. The massage itself is great, but what really made it so unexpectedly memorable were the sea lions playing in the ocean right outside my door! It might not be practical to open those French doors during the winter months (and I don’t know what the sea lions’ schedules are like), but let me just say that no New Age background music could ever compete with the sound of those noisy blubbery rascals lulling me into total bliss. Treatments (called Rituals) start at $190 for 60-minute facials and around $195 for 60-minute massages and wraps. Much like everything else about the sprawling Four Seasons property in Westlake Village, the spa here is big. How big? Try 41,000 square feet big. A stark contrast to some of the more intimate spa experiences I’ve had, this place is ideal for a girls’ day out, bridal showers and birthday parties, a few of which I saw while here. That said, it’s not overwhelmingly big. It actually gives a sense of serenity because you realize you have so much space to just relax. There are 28 treatment rooms (each with their own little walled-in outdoor garden), 30 face and body treatments and 12 types of massage. Another good feature is the big outdoor pool area lined with chaise lounges and cabanas that you can reserve. Body treatments start anywhere from $150 on up, and if you can get away during the week check out Wow Me Wednesdays. Designed with the busy parent in mind, the package includes a 50-minute organic facial or massage of your choice for $130. Almost worth having a kid just to get this deal. Almost. 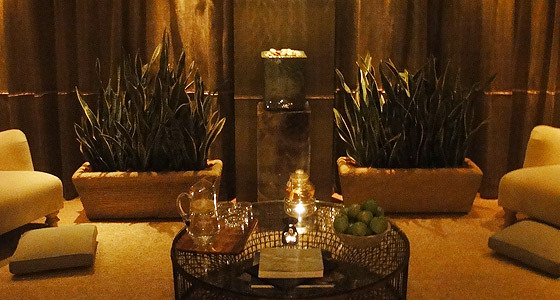 Winter, spring, summer or fall, all you gotta do is call the Spa at the Four Seasons for one of the best pampering experiences in LA. The spa isn’t the biggest nor the slickest, but that’s what I find charming—it kicks it old school yet stays on top of all the high-tech treatments. Case in point: The Ultrasonic Resurfacing facial, which is similar to microdermabrasion but uses ultrasonic waves instead to exfoliate, smooth and brighten your complexion. The staff will make you feel like a VIP and the talented estheticians really works wonders for the skin. (After all, they work on celebrities for a living.) As for the body stuff, definitely try the Punta Mita Retreat, a 90-minute margarita scrub detoxifying massage with tequila (!) and sage oil for $270. It smells divine and despite all the tequila, you can still drive when you’re done. There is just about every treatment you can imagine (I did the Chuan Harmony massage) and a few you probably would not … like ear beading. Yes, ear beading. Ear beads are these super tiny little metal-looking beads that are placed along the pressure points of the ear and stay on for up to a week and are said to help with everything from weight loss to stress reduction. This spa is all about a holistic approach — before you have your treatment you fill out a card based on how you’re feeling that day and it helps determine what ‘color’ and element you are so they can better serve you. Treatments start at $165 for a one-hour massage. Did you know that the ultra-luxe Hotel Bel-Air didn’t have a spa until its revamp a few years ago? Thankfully, even if you’re not among the 1% who can actually afford to stay here (rooms start at about $500 a night) you can still pamper yourself. The spa is located way in the back of the property, which is a good thing ‘cause you can take a leisurely stroll and enjoy the swans, the fountains and all the beautiful, lush landscaping. 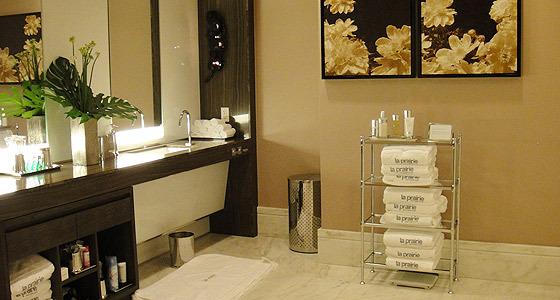 The spa itself is spacious but maintains an intimate feel with subdued accents and warm tones. There are seven treatment rooms including my favorite, a private couples/group suite with a tub, lounge chairs that double as mani/pedi stations and outdoor courtyard. Aside from the fab facial I got here (with those signature La Prairie eye patches), I love the twinkling lights in the steam room … it’s kind of like spa-ing beneath the stars. Facials start at $210 for 60 minutes. This spa offers outdoor yoga and the HydraFacial, a non-invasive, 30-minute treatment that helps with hydration and anti-aging. No discomfort, no downtime, just all around good feelings. 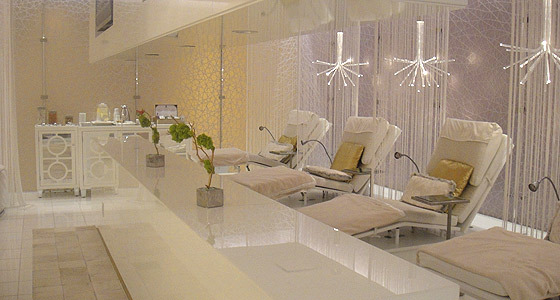 With a minimalist-meets-Jetsons aesthetic, the Ritz-Carlton Spa in Downtown LA is indeed a modern urban escape. Located on the second floor of the hotel, there aren’t any rooftop views, but there are plenty of amenities to keep you occupied. The eucalyptus steam room is outfitted with the prettiest, most comfortable ergonomically shaped chaise lounges (why doesn’t every spa have these?!) and the comfy lounge area with sofa beds is perfect for pre- or post-treatment relaxation. I love that organic products are part of their treatments, including the signature Champagne and Shimmer Body Treatment which uses all-natural scrubs and creams infused with real 24k gold. It’s $230 for 80 minutes but you’ll look (and feel) like a million bucks. 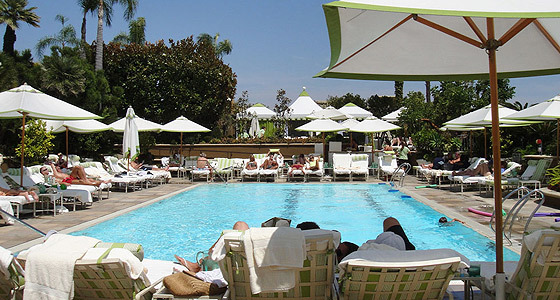 I’m going to Palm Springs in April for my birthday and I will look into the Miramont – thanks for the suggestions Mar! 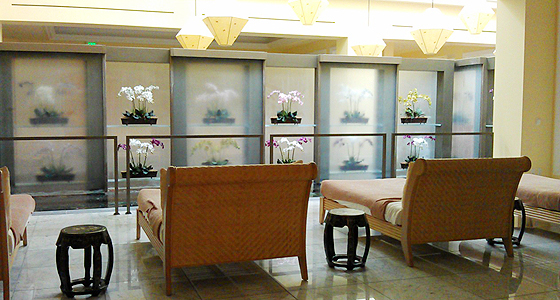 thanks mar for including the green and serene spa at casa del mar in santa monica! i loved designing it but i love it even more when i hear how much guest enjoy it. 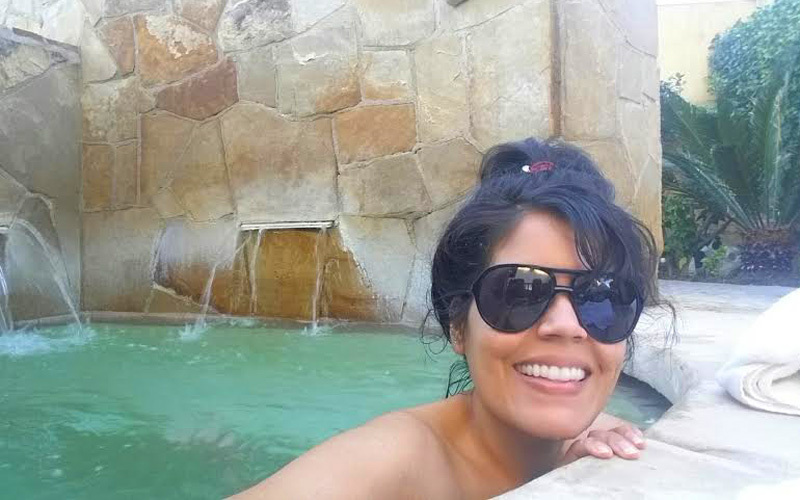 I love the spa at Four Seasons and Casa del Mar! I also love the one at Beverly Wilshire – so sumptuous.